I am horrible with names. I tell everyone that I'm so bad with names that I have a job with my name tag on my shirt so I can look down and remind myself what my own name is. I suppose the first time I realized this was while helping out with Senior High Youth Group. The youth minister would talk about a particular teen and call them by name and I would not have a clue who she was talking about--so she would have to describe them to me. She tried to help me and one year she took pictures of all the teens who were in confirmation and wrote their name, their school and their grade on the back and I was able to use them like flash cards in order to learn everyone's name. And I nailed it. I knew who everyone one was. That is, until the next class and wouldn't you know it---they all changed clothes or hairstyles and I was lost once again. I got so bad that in 2009 at a conference and just called all of the teens, "Timmy" with an adjective in front. There was Tall Timmy and Short Timmy and Smiley Timmy, just to name a few. And I of course was, "Mr. Timmy." It's not just at youth group though. It's everywhere. At work, I've forgotten the names of the people who work for me and had to resort to looking at their names tabs and to make it worse---I have three officers who work for me that have the same name! 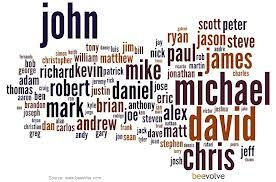 At home, I've been known to go through a litany of names in order to get my own kids names right. It's not uncommon from me to called my oldest daughter by youngest daughter's name or even call one of my dogs by the kid's names. Heck, sometimes I have to ask them what their name is and threaten them not to lie to me because I live there and I'll find out who they are (credit to Bill Cosby for that one). I get frustrated. It's like there is a glitch in my brain----a short circuit. A month ago I was at a conference and on the last day I started calling one of the ladies I was there with by the name of a mutual friend---who was not even at the conference!! What makes it particularly frustrating is that I understand the importance of a name. It's a person's identity. It is who they are. In the Bible, when God changed people's mission in life He would change their name. Abram to Abraham, Saul to Paul or Simon to Peter. I understand the importance of a name. I've used people's names in order to calm them down. I've been on calls where someone is upset and I'll ask them their first name so that I can talk to them in a calm, rational discussion and it's amazing how well it works. Because, by calling a person by their first name shows a little familiarity so it helps the person realize that you are trying to understand why they are upset and are showing them some respect. So, I understand the importance of a name. I understand the respect that it shows. And it drives me up the wall that I'm so bad with it. What bothers me more---I can remember numbers---just not names. Go figure. So, if I ever stumble over your name or out of the blue just call you "Timmy" please understand, I'm not being disrespectful. That part of my brain just doesn't work.